Members of Oberlin’s KOI Collective, (starting top left) Natsumi Osborn, Soomin Kim, Elizabeth Kate Hall-Keough, Kari Watson, Eleanore MacPhee, and Charlotte Hill. 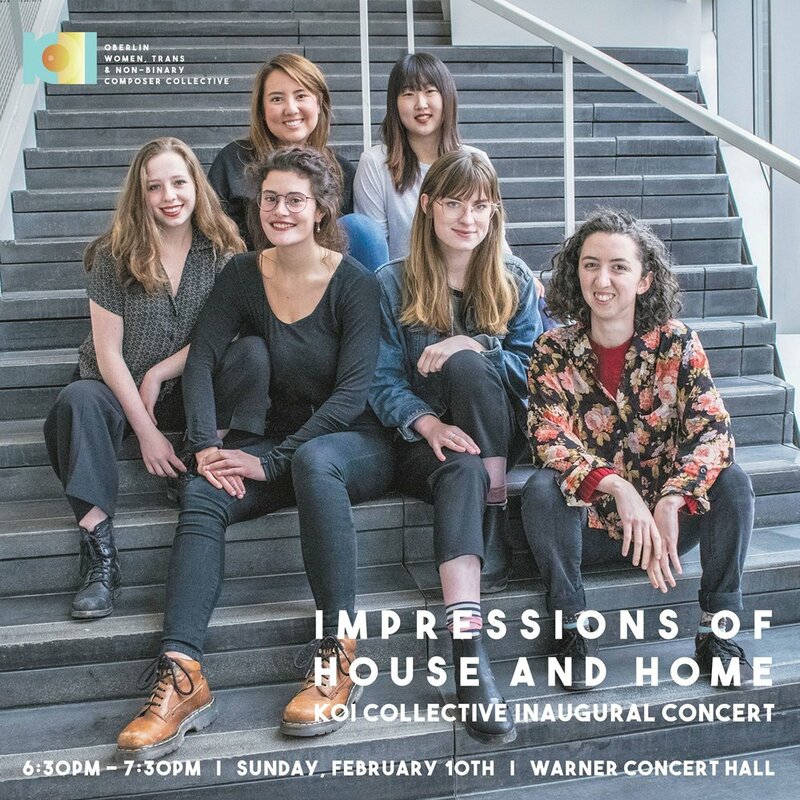 KOI Collective was founded in 2018 with the coming together of three Oberlin composers, Soomin Kim, Kari Watson, and Natsumi Osborn. With the goal of creating a sustainable infrastructure within the Oberlin composition department that supports women, trans, and non-binary composers, the collective organizes collaborative projects, online publications, and community engagement initiatives with young musicians. In January of 2019, the collective received the Flint Initiative Grants to spend three weeks in Arts, Letters & Numbers artist residency in Averill Park, NY, collaborating on a four-part suite for piano trio titled Impressions of House and Home with The Variant Trio. The work, consisting of three individually-composed movements and a co-composed one, was premiered in Oberlin, OH at the KOI Collective Inaugural Concert in February, 2019. Exploring vastly different backgrounds of the three composers, Impressions of House and Home was praised as being an “imaginative use of the medium.” The collective’s upcoming projects involve online publication of their work through various social platforms including their website, and workshop on marginalized composers of the contemporary classical music scene for the musicians of the Northern Ohio Youth Orchestra, with which Watson is currently the composer-in-residence. The collective is seeking more collaboration opportunities with music education institutes in giving the workshop, which includes presentation on female composers such as Meredith Monk and Pauline Oliveros, and interactive music-making exercises.